Had it not been for the enterprise of Robert Beith from Ontario, the hackney show would have had a decidedly slim representation. Robert Beith won two Hackney championships at two worlds fairs and his imports presented at the 1904 fair brought much public attention. Beiths winning horses included Cliffe Rosador, who won the two-year old division; Priscilla, who won the mares; Terrington Bonnibel, another winning two-year old; and his winning stallion, Saxon. The Hackney show was small but quality was high. Henry Fairfax was the judge for this breed. He was a well-known breeder. 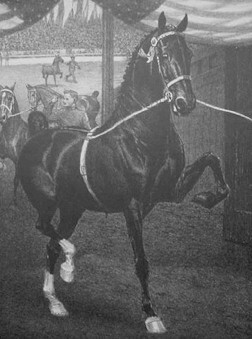 He had been one of the earliest importers of the breed and was the most successful producer of heavy harness horses in the country by use of Hackney stallions. Overall, Robert Beiths stallion, Saxon, was the senior champion and then made grand champion. His mare, Priscilla, won female senior, and then grand female honors. Stallions-Four years old or over: Saxon : Exhibitor R. Beith, Bowmanville, Ontario. Stallions-Three years and under four: Truman's Cadet: Exhibitor Truman's Pioneer Stud Farm, Bushnell, IL. Mare-Three years and under four: Leading Lady: Exhibitor L.W. Cochran, Crawfordsville, Ind. Worlds Fair Bulletin; Awards in the Live Stock Department., Worlds Fair, St. Louis, October 1904. The Breeders Gazette. August 31, 1904. This page was designed by Cara Borneman and is maintained by Lyndon Irwin.